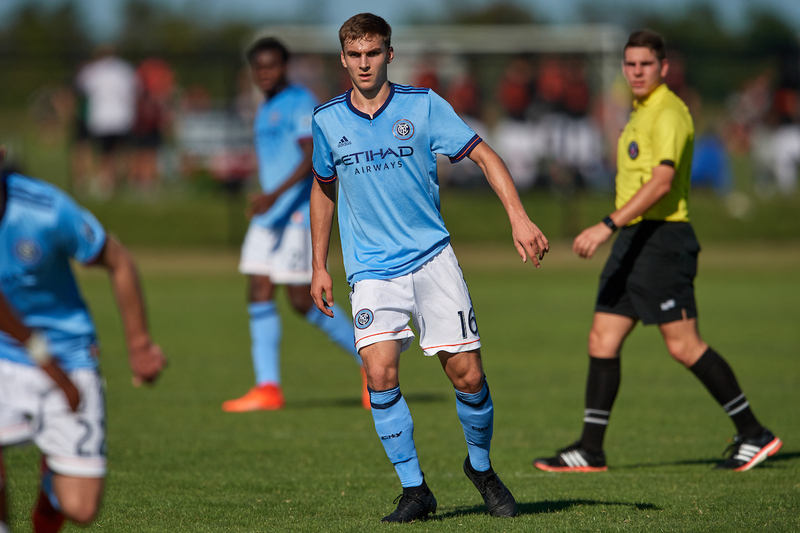 James Sands is New York City FC's first-ever Homegrown player. This fall, the pro contract became all the more real when Sands came on as a substitute for legendary Italian midfielder Andrea Pirlo to make his first professional appearance. Sands became a part of the club's inaugural Development Academy roster in 2015. When NYC's U-18/19 squad faced Atlanta United FC at the recent Boys' Winter Showcase, he took on fellow professionals and U-17 MNT World Cup teammates Andrew Carleton and Chris Goslin. Pro clubs across the country are investing in their futures more and more through the U.S. Soccer Development Academy and this week over 30 current professional players competed at the Showcase. The Academy strives to provide world-class environments for player development, and the recently completed event served to sharpen dozens of young pros looking to take the next step. "Coming in here and getting meaningful minutes against other good Academies is definitely important for my development," Sands said. "You're always getting a good game here. It's great to see other teams. Seeing how other guys do at their clubs motivates me to do well with mine, and hopefully we can see each other on the first team someday." In addition to a handful of MLS Homegrown signings, several USL players made appearances at the U-18/19 level in Lakewood Ranch. St. Louis FC Academy's Showcase lineup featured two players who have played for the first team: Jack Maher and Aedan Stanley. They had the opportunity to test their mettle against an LA Galaxy squad that featured five players who've logged minutes for LA Galaxy II. "This Academy environment is the next level," Maher said. "You're playing against the top competition for your age. It really opens up the door. If you can play here, you have a very good chance to be able to play professionally somewhere because this is the top youth division for the USA." The pair of defenders earned their stripes in the Development Academy, both garnering Central Conference Best XI honors last summer at the U-16/17 level. Stanley has been in the St. Louis youth system since his U-14 days, and he was the first player to make the jump from the Academy to the professional ranks. He earned his first appearance with the USL side at age 16. "I take it as a stepping stone," Stanley said. "I take it as a place to grow and I think that's exactly what I've done. The environment the Academy sets up is one you can't mess with. It's always a competitive environment. It's a professional environment no matter where we are, Showcase or training." The Academy developed the professionals present at last week's Showcase. As the country's highest level of youth soccer, it provides the opportunity for players to cut their teeth against the nation's best week in and week out. Goslin became Atlanta United's second Homegrown signing in October 2016. Though he's yet to make his first team debut, he's appeared with the USL's Charleston Battery over the last two years. "Playing games out here really does develop guys to go to the next level," Goslin said. "It's really good to come out here and see the standard. The Development Academy developed me to become the player I am now. At an event like this, you see everyone. Everyone that went to the [U-17] World Cup, every guy that has ever been to a National Team camp." Carleton, Atlanta's first Homegrown signing, earned his MLS debut this May. After a strong showing with the U-17 Men's National Team this year, Carleton is eager to earn more regular professional minutes. The Academy is the perfect place to make his case. "Getting games is always important, especially when you're trying to break into the MLS team," Carleton said. "To be able to play against some of the top MLS academies and top academies in the country definitely helps to get those minutes and get those games in." During the Showcase, Carleton and Goslin not only took on Sands, but also a Seattle Sounders U-18/19 squad that featured eight players with USL appearances, the most of any team at the Premier Sports Campus. While the pair of Georgians faced off against several professional players, who knows how many future pros they squared off against? Carleton credits the Academy for his opportunities at the next level. In bringing together the Academy's 77 clubs, the Showcase gathers not only some of the nation's brightest already under contract, but also the next generation of professionals. "Being able to have that platform to showcase my talent, and the talent of everyone that plays in the program, gives you good exposure," Carleton said. "The Academy gave me the platform to play in front of the people you need to in order to get exposure to the pros."